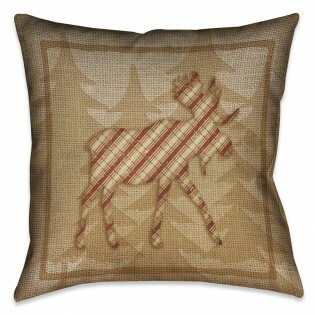 Our Country Cabin Moose Plaid Pillow features a plaid moose over a forest pattern. The design is completed with a sackcloth textured background. This nature inspired pillow is sure to suit any outdoorsman or wildlife enthusiast. The pillow also features a plaid pattern on the reverse side. Design is digitally printed to create crisp, vibrant colors and images.